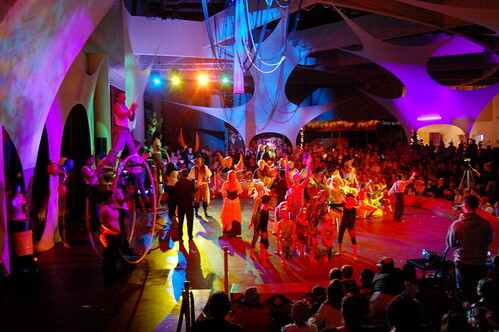 Otherworldly Circus, originally uploaded by nataraj_hauser / eyeDance. Sunday afternoon I went to see the youth of Madison and surrounding cities perform in (among other things) a circus. All the acts were technically kids, but there were a couple who were right up there at the adult end of the scale. The circus was great fun, and you could tell the kids had worked hard to bring it all together and make a bunch of solid performances. There were jugglers, unicyclists, aerial dancers, stilt walkers, puppeteers, clowns, and so much more. Wow! This whole series and the event looked great!!!! Thanks!